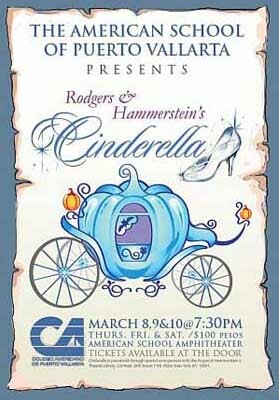 The American School of Puerto Vallarta is proud to present on their 25th Anniversary, one of the world's most beloved musicals, Rodger and Hammerstein's magical Cinderella on March 8, 9 and 10 at the ASPV Amphitheater on campus. The performance will begin at 7:30 p.m. The cast of 25 talented students will present the retelling of this timeless tale and one of the most romantic stories of all time. We hope you will join us on this magical journey to a place not so far away where impossible things are happening every day! The students of ASPV will sing all the unforgettable songs from this classic Rodgers and Hammerstein musical, including, In My Own Little Corner, It's Possible, Do I Love You Because You're Beautiful? and many more. Re-live the magic or experience it for the first time here in beautiful Puerto Vallarta. It will be great fun for the whole family. Dressing up in your most lavish ballroom attire is encouraged! We hope to see all of the princes and princesses of Vallarta in the audience. Join us at the American School of Puerto Vallarta Amphitheater (on campus), Albatros 129, Marina Vallarta, March 8-10 at 7:30 pm for a performance of the much-loved musical, Cinderella. Tickets for this magical event cost just 100 pesos and may be purchased at the door.